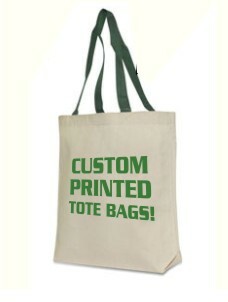 great way to go green and promote your club, business or organization. Natural 100% cotton canvas tote bags with contrasting colored handles (black, royal blue, red, forest green, or navy blue) custom printed with your organization's name and logo. Custom printed tote bags are great for giveaways at special events, or fill the tote bags with goodies and give them as gifts to your customers. Order as few as 10 tote bags or as many as you want. I ship anywhere!